I have seen more than a few things over the years that have remote controls mounted to the steering wheel of a car. Honestly, I never liked any of those. I don’t think the steering wheel is a place for accessories to be mounted personally. 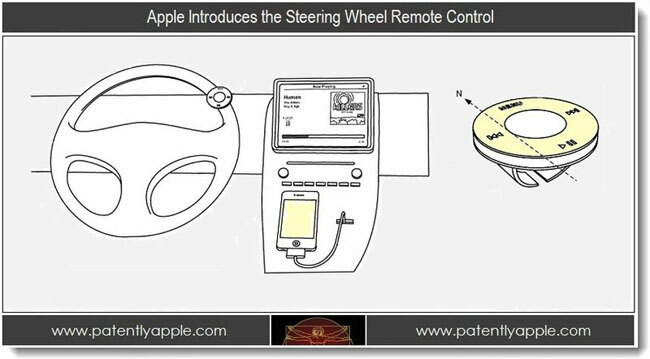 Apple was granted a new patent this week that covers a steering wheel mounted remote control for the iPod and iPhone. It looks like this patent was filed for a long time ago judging by the line art because the remote looks like something from several years back. I would imagine the design would be a little sleeker if it were produced today. The remote is designed to control the music on an iPod connected to a car’s audio system and gives forward/back and pause/play functions along with what appears to be a menu key. It looks like device attaches to the steering wheel with a simple clip. I could see people catching their hand on this in an emergency and having issues or see it flying off the airbag deployed and hurting someone in the car.